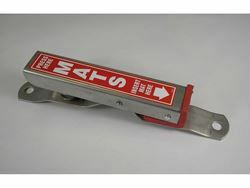 Heavy duty mat clamp easily mounts to any wall or flat surface. Industrial grade spring loaded tension for secure matt holding. Excellent for air drying saturated mats from pressure washing or heavy shampooing. Allows user to work on mats in an upright position instead of the ground or floor.